Mists of amethyst and leaves of tangerine, russet and flame-gold: you’d best put off the jewellers until you’ve visited a park for inspiration. Enjoying the poetry of April colour is just the half of it; the other is harvest. An autumn table may be stacked with pumpkins and pears, hazelnuts and walnuts, pomegranates and persimmon, sweet chestnuts, golden nuggets and – in a world of its own – the quince. 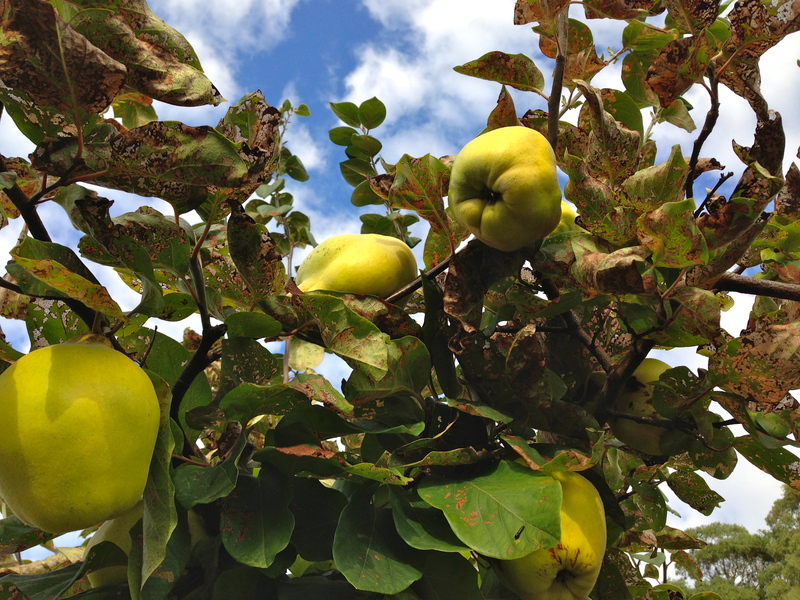 Lumpy, dusty, blotchy and high maintenance (you can’t eat it straight from the tree), the old-fashioned quince will have you reaching for a recipe. Yotam Ottolenghi’s lamb-stuffed quince with pomegranate and coriander is tempting but tricky; another Londoner, Tessa Kiros, offers the Greek treat of baked quinces with brown sugar, cinnamon and walnuts. I’m happiest, though, with the way I ate my first quince, using a recipe given to me by my neighbour Suzanne, along with a bag of quinces from her orchard. Cover peeled and quartered fruit with water and sugar (1 cup sugar to 2 cups liquid), add a vanilla bean and lemon juice, and bake without stirring in a covered casserole at 150 degrees for 4 hours until quince is deep red. The kitchen will smell of quinces for days if you leave them to bake, slowly, like this. It’s hard to see the point of quince jelly when you’re served a bowl of soft quinces dribbled with double cream. And now that I’ve planted my own tree, I appreciate how the golden fruit hangs on while the leaves drop, making the season seem less melancholy.